How are we going to pay to rehabilitate people re-entering society after incarceration? Do you support medical marijuana at the federal level? Has there been any evidence about security issues surrounding Syrian refugees? Senator Mike Lee hosted this interactive Vekeo event with the residents of Weber and Morgan counties. Senator Lee answered questions from participants about the specific issues affecting those who live in these counties. Topics addressed included the Syrian refugee situation, public lands initiatives he's been working on that deal with the reintegration of wild sheep on public lands, healthcare, and medical marijuana. 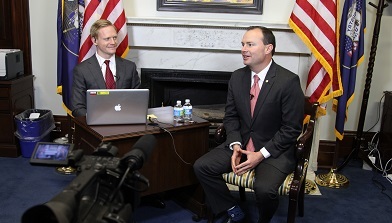 Senator Lee encouraged participants to contact him if they need help with any federal agency.